This unique Cal-Mil 1204-13 three section bread box is made of stylish, green edge acrylic. Its three black acrylic trays are perfect for storing fresh-baked breads, pastries, or muffins and are easily removable for rapid cleanup and refilling. This Cal-Mil 1204-13 bread box features a convenient black handle for easier access in either full attendant service or self-serve applications. A modern, black wire base provides additional stability and adds a sophisticated twist to this simple piece. 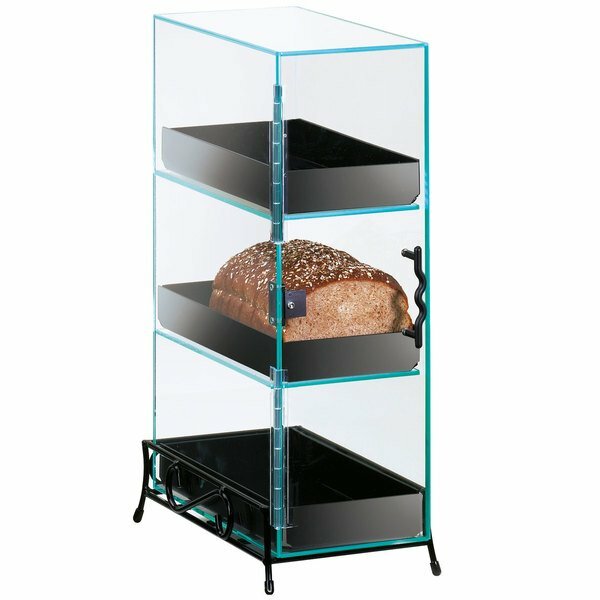 Thanks to its narrow 7" width, this display case is perfect for areas with limited space, but with three vertical tiers, you'll always be in good supply. Another great product by Cal Mil. Great construction and hold up under years of washing. We used to pay nearly double for the exact same item from our last vendor. Much happier with the price here at Webstaurant. Love it! Was shipped to me at a timely matter and packaged nicely. Got quite a few compliments on the display and it showed off my cinnamon rolls wonderfully and at a closer eye level. Well worth the money! This displays was a great addition to our bakery! It allows the customers to see what bagels we have for the day. It looks very nice and it's easy to clean out at the end of the day!